We all like to be beside the seaside and Northumberland has a coastline to envy with a maritime heritage to match. Such is the importance of the landscape and the flora and fauna that a large part of the coast is designated as Northumberland Coast Area of Outstanding Natural Beauty (AONB). 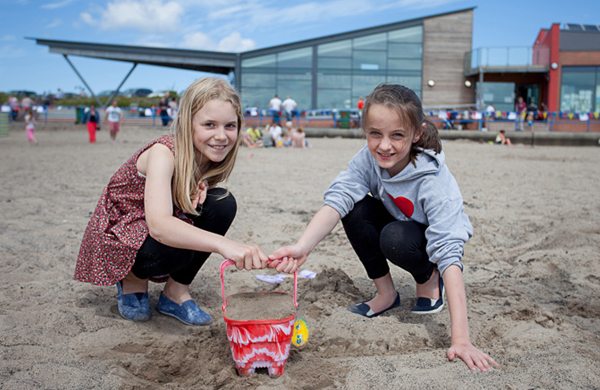 Here’s why: Newbiggin Maritime Centre - a new and exciting attraction. See the Mary Joicey lifeboat, discover the significance of the ‘gansey’ and learn of this communities’ long and fascinating relationship with the sea. Explore the Sea Shore Shop then relax in ‘The Point’ café while enjoyinggood food and spectacular views of the bay. Here’s why: A World War I coastal defence artillery battery which also saw service during World War II. There surely has to be an explanation why some Battery buildings are painted pink whilst others are painted grey! Ask one of the knowledgeable site volunteers. Here’s why: If a harbour looks like it is silting up and therefore in danger of becoming less commercially successful, what is the solution? Construct a sluice which scours away any accumulation of silt and in the process provide your village with a new name. Site interpretation boards reveal more of the story. Here’s why: In 1719 the English Baroque architect Sir John Vanbrugh (1664-1726) designed this “party palace” for the “wild and wonderful Delaval family”. Both house and family were larger than life – learn all about it at the National Trust’s newest Northumberland acquisition. Newbiggin by the Sea – the Town Heritage Trail can be combined with the Newbiggin by the Sea Art Trail to discover more than 40 pieces of public art, the most famous being “Couple” by sculptor SeanHenry. With an impressive selection of over 500 personally inspected holiday cottages to choose from in prime locations stretching along the magnificent Heritage Coastline and venturing inland to the stunning National Park and Cheviot hills, Northumbria Coast & Country Cottages is the popular choice for a holiday in Northumberland. Established in 1981, and with sales offices in the key tourist coastal villages of Alnmouth and Seahouses, it’s the largest independent holiday cottage agency in the area. Priding themselves on offering good value, quality cottages combined with a first class, friendly service, Northumbria Coast & Country Cottages has been awarded a VisitEngland Quality Accredited Agency marquee, which is given to agencies exceeding industry standards of compliance and customer service, offering consumer assurance of booking with a reputable company. Newbiggin Maritime Centre, on the beautiful Northumberland coastline, offers a unique experience for visitors with a museum, a café and a shop.